Allergies occur when your horse's immune system reacts adversely to something in his body or general environment. Common allergens can acquired through touch, inhalation, consumption or occur as the result of a bite or a sting. As a horse owner, you need to be able to recognize the signs of minor or severe allergic reactions in your horse. Hives are a common sign of an allergic reaction in a horse. Hives occur as patches of red bumps on your horse's skin. Hives manifest most commonly on your horse's legs and barrel but can occur anywhere on the body. Hives can appear quickly and may take weeks or even months to disappear. Hives may also be called welts. Hives may be accompanied by itchiness, scratching and hair loss. A horse suffering from a mild allergic reaction, such as to dust in the barn or to pollens, may experience a runny nose. The discharge from a runny nose that is caused by allergies will be clear, because no infection or illness will be present. It's not uncommon for a horse's eyes to be red, weepy or irritated. If your horse is allergic to something he has eaten, he may suffer from diarrhea. In a horse experiencing a severe allergic reaction, respiratory problems may occur. If you notice your horse experiencing breathing problems or beginning to wheeze, call your veterinarian immediately. Swelling in the throat can occur as a result of an allergic reaction and, if left untreated, can cause serious health concerns for your horse. 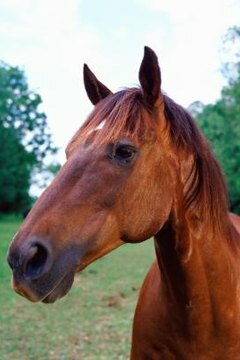 Anaphylactic reactions can occur in a horse who has an extreme allergy to something, such as a vaccination or other medicine. A horse who experiences this type of allergic reaction become very sick very quickly. A typical anaphylactic reaction will cause the horse's blood pressure to drop while he experiences internal swelling that makes it difficult for him to breathe. If left untreated or not treated rapidly enough, the horse is likely to collapse and die. Immediate veterinary treatment is necessary if your horse is going to survive anaphylactic shock. What are the Causes of Bloating in Horses? Can Parvovirus Be Contracted by Horses?